Centuries before Christ, God was preparing the way for His Son’s arrival. From mankind’s original sin through the children of Israel’s on-again, off-again obedience, God was faithful, honoring his promise to Eve (Genesis 3:15), which first pointed to Jesus. In People of the Passion, you will see God working through the lives of ordinary people to achieve His ultimate aim; our salvation. There are prophets, priests, and kings, servants, soldiers, and civilians -- each with a role in the high drama of Christ’s passion. You may see yourself in some of these people -- ordinary individuals who, like us, need a Savior. 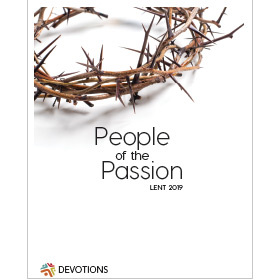 Available to read online or as a podcast beginning March 6, 2019, People of the Passion can also be received as an e-mail subscription throughout the Lenten season. Churches can also download, personalize and print them to give to congregation members or use as an outreach tool with guests and visitors. The audio version will be available on the daily devotion page beginning March 6, 2019.